Carrot & Lime Homemade Hair Oil Recipe for Hair Growth - beautymunsta - free natural beauty hacks and more! 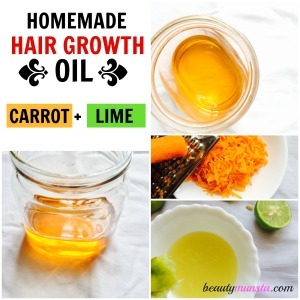 Learn how to make this carrot and Lime Homemade Hair oil for Hair Growth. 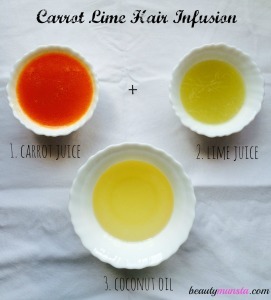 Carrot, lime coconut oil hair infusion…such a sensational, exotic and exciting hair blend, isn’t it? 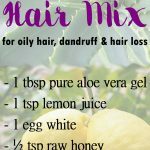 You probably already know that lemon and lime are great for hair growth because they prevent dandruff and itchiness that contribute to hair loss. But carrots?! Yes, we will be using carrots too in this homemade hair oil for hair growth because carrots are rich in so many vitamins and minerals that promote faster hair growth. I’m so thankful for my lovely mom – when I told her about my thinning hair, her eyes just lit up as she described to me this carrot lime hair oil, that enriches the hair roots and shaft and promotes hair growth! The best part about this hair infusion is that it’s totally homemade, using all natural and only three, but wholesome, ingredients! Below, I’ve listed the amazing benefits of carrot juice, lime and coconut oil for hair. Drinking carrot juice is very nutritious for the overall body, including hair and skin, as it is bursting with vitamins and minerals. But how about when used for hair externally? Well, it does just the same wonders when used topically too! Carrot juice is most known for its luxurious hair softening properties that helps treat dull brittle hair, giving it a smooth soft texture. Its boat load of nutrients will help maintain healthy strong hair. 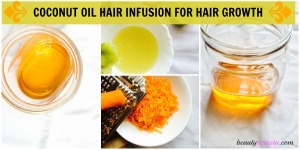 The nutrients in the carrot juice will not get destroyed in the cooking process of preparing this hair oil infusion. In fact, it is known that the nutrients in carrots are more efficiently absorbed into the body when cooked or juiced! Lime, just like lemon, is excellent in treating and clearing out dandruff and flaky skin on the scalp. 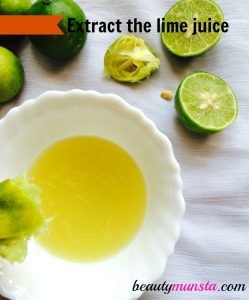 For Lime juice will also help clear out excess and stale oils on the scalp. It also helps seal the hair shaft which gives a ‘shine’ effect to hair strands. In this hair oil infusion, it provides a refreshing scent and soothingly relaxed the scalp. Yes, you can distinctly smell the lime juice in this hair oil – it doesn’t fade away! Like many other hair oil infusions, coconut oil acts as the base for this hair oil infusion. It is versatile, smells wonderful and penetrates deep into the hair follicles and shaft, thereby promoting hair growth and thickness. Stainless steel sauce pan to cook the hair oil for up to 20 minutes without sticking to the sides. Stove to cook the hair oil. Glass jar to store your oil. I just recycled an empty nutella jar. 1. First, start by gathering all the ingredients and necessary tools to make this hair oil infusion. You will especially need a high speed blender to get fresh carrot juice, and a stove top to cook the hair oil. First extract your carrot juice. 2. Peel, wash and scrape a medium sized carrot (I actually used 1 and ½ carrots but 1 is enough). 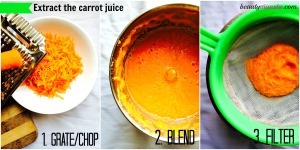 Blend the scraped carrots with ¼ cup of water. Strain the carrot juice and keep it aside. Note: You can use lemon juice instead of lime juice. 3. Next, wash some limes and squeeze out the juice until you collect ½ cup. Ensure to remove the seeds if any fall into the juice. These are the basic ingredients needed – now onto the oil infusion preparation stage! 4. 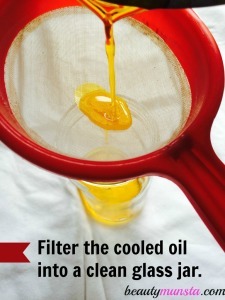 Measure out 1 cup of unrefined liquid coconut oil and pour all the about ingredients into a stainless steel sauce pan. Place it on the stove and reduce the fire to medium. 5. After about 3 minutes, it will start boiling around the edges and bubbling. Now, it’s time to turn the heat on high. Gradually bring the mixture to a boil and once its starts bubbling, make sure you stir it frequently. 6. As it continues boiling, give it a little stir with a wooden stick. At around 10 minutes, you will notice that the liquid is still thick and the water is evaporating. Leave it to boil. 7. 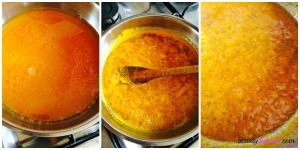 At about 12 minutes, all the water will have evaporated and the oil will start to separate from the carrot puree. 8. At around 17 minutes, the bubbling and boiling will have completely stopped and the carrot puree will now be visibly separating from the coconut oil. 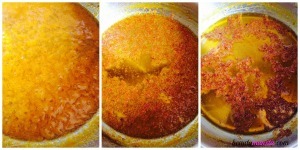 The solid matter from the carrots and lime will separate and float above the oil. 9. Leave the oil to simmer a bit for 2 minutes. At 19 minutes, there’s a wonderful coconut carrot aroma in the air! It smells oh-so-delicious like carrot cake! 10. It’s time to switch off the fire and let the oil cool down completely. By this time, the aroma was too irresistible and I just kept sniffing non-stop! Filtering the lovely sunset-coloured oil! 11. When it’s completely cooled down, carefully strain the hair oil into a glass jar. 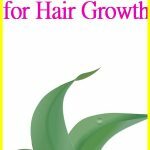 Your coconut oil infusion for hair growth is ready! Leave in overnight and wash off the next morning. Leave on for an hour or more and wash off. And lastly, you can apply this hair oil as frequently as you like! Personally, I try to apply it frequently and just leave it on my hair without washing off, just like a leave-in conditioner. I know this is the umpteenth time I’m bragging about the smell but when you actually make it you will seriously love the carrot cake aroma! If you don’t have lime, you can definitely go ahead and use lemon juice. Lemon has the same anti dandruff properties as lime and smells refreshing as well. Try as much as you can to use freshly juiced carrots and freshly squeezed lemon juice. Store bought juices can have additives and preservatives that may irritate your scalp! Be careful not to leave the mixture boiling on the stove, as it can very easily get burned (you can know when it’s too cooked if it turns a terrible orange-brown color. Stand nearby and monitor it for just 20 minutes till it’s ready. 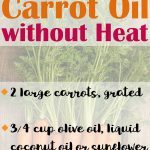 Make this brilliant diy carrot oil hair infusion last long by storing it in a clean dry place and most importantly, make sure not to get any water into it. More DIY Herbal Hair Oil Infusions! 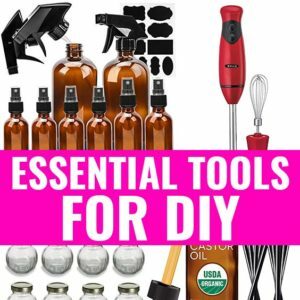 Check out our guide – DIY Herbal Hair Oil Infusions: For Hair Growth, Damaged Hair & More, How to Make & 20+ Recipes. 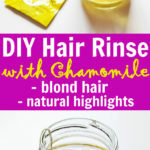 It talks about how to make more of your own herbal hair oil infusions for hair growth, damaged hair, dry hair, getting rid of gray hair, anti-aging, scented hairs oils and so much more! This book contains methods of infusing your oils, the best base oils to use & their benefits, A-Z herbs and spices to infuse and over 20 herbal hair oil infusions! 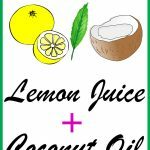 Lemon Juice and Coconut Oil for Hair Growth, Dandruff Control & More!